So you want a recording contract (part 2)? This week our music industry insider from Circle Recording Studios in Birmingham helps you think about your brand and why that is important. 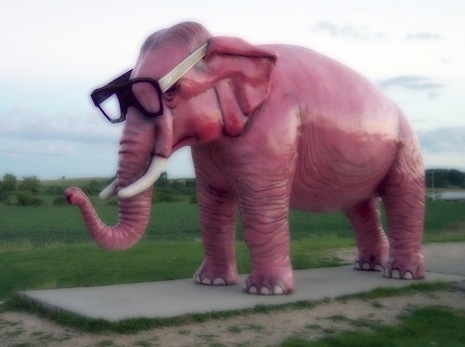 So not that easy to describe (though you'd recognise a pink elephant immediately when you saw it - even if, like this one, it's in disguise). Seriously though... your brand, if you like, is your essence. The core of what makes you... you. And, at the same time, it's what makes you fundamentally different from everyone else. No two original bands have exactly the same brand. (That's why when a young band comes in the studio and says "we want to sound just like Greenday/McFly/Whoever" I say, I've got bad news for you... There already is a Greenday/McFly/Whoever")! But if your brand is like your DNA, then there's a bunch of threads that run through it. Your sound itself (made up from everything from your chord structures to your lyrics themselves to the way you put them across), your look from the clothes you wear (whether that's red leather thongs, bowler hats or, god-forbid, tartan shirts) to the way you wear them, your behaviour (on stage and off) and finally, both your approach to life/love/war/peace/social issues etc and how you put that across. So if you want to make your brand coherent, something that fans can buy into and believe in, then you need to understand it and believe in it yourself. Because only then can you ensure that everything you do (from what you wear, to what you sing about, to how you interact with people) is in-keeping with that brand. Why is that important? Well, because more than ever before, and whether you realise it or not, you are communicating with a variety of audiences all of the time. Every time you post on Twatbook and/or Youface, every time you play a gig, every time you (or your mates) upload anything on the Internet. And whether that post at 3am was only intended for your Aunt Jemima or not, everyone from your best friend from kindergarten, as well as your hard-core fan base, the A&R guy looking for a band to sign, and the radio DJ you might need to play your music or the journalist you might want to review your record, all got it. So it's worth, at the least, thinking carefully about how any post/upload/un-rehearsed cover you play as a request at a gig, will go down with all of your audiences. Because if you turn any of them off enough now when you aren't paying attention to them, they may not be there for you when you are. In short, really understanding and defining your brand is about focus. It's about taking a sniper shot rather than a shotgun blast (a sniper shot will go much farther while a shotgun wastes a load of energy, makes a lot of noise and ultimately falls short). Chances are though, you don't have loadsa cash. (I mean you are a musician... right?) 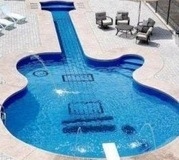 so colourists are probably as far removed from your world as guitar-shaped pools are from mine (that would be cool though, right? ;-)). So, at the outset at least, you're gonna have to think of all this yourself. Now honestly, I can't tell you who your audience is and what your brand needs to be to attract them, but you just need to apply some common sense here. If your audience is, say, 26-40 year olds (an interesting demographic as they tend to spend more money on music than younger generations), chances are they'll be less impressed with teenage antics than a bunch of 13-16 year olds might be (though of course if your audience is 13-16 year olds how will such antics play out with the publishers and playlist committees). So in the cold light of day analyse what you are and what you stand for, understand what might turn on (and turn off) your target audiences and then make sure you do as much as you can of the former and as little as you can of the latter. And think too about how anything you say or do will play with your other audiences (everyone from those A&R types with their mythical cheque-books all the way through to your Aunt Jemima). But I return to my earlier point, fundamentally, your brand must go to the core of you. If it doesn't, it won't be believable or coherent. And if you can't get your target audience to buy into you, you might as well get a job in McDonalds flipping burgers now. The author of Machiavelli's Guide, Trev is a record producer and Chief Engineer at one of the UK's top studios, Circle Recording Studios in Birmingham. Check it out at www.circlestudios.co.uk. He has worked with clients ranging from record labels to Yamaha Corporation's R&D team and artists from Bruce Dickinson to Henry Rollins. As this blog goes to press, he is recording drums in New York City. You can follow @circlestudios on twitter. Go say hi!